Sorry I've not been around much lately. The past 9 months have been pretty hellish all round and I'm still not through it all. Hence the reason for just review posts. Which isn't what this blog was supposed to be solely about. One of the biggest things I've been dealing with lately is coming to terms with my eldest daughter's autism. I've had suspicions about her behaviour for a long time but it has really hit home over the last year. The meltdowns, the tantrums, the hiding of food (and that's just me lol!) have all made her autism all the more real. For a while it was something I could just forget about most of the time except for the odd occasions it reared it's head. But now it's with us nearly every minute of every day. Probably the behaviour I've found hardest to deal with is the 'inappropriate urination' to use the posh term. Basically, when she's stressed, she wees in the wrong places. On people's lawns, on the settee, at the playbarn etc! At first it was usually a signal that something was wrong but would stop once the problem, whatever that was, had been removed. But after me and my husband split up in September it became an intermittent problem until the beginning of this year when it became a regular occurrence. It is mostly limited to her bedroom but it's been so frequent that her room just stank like a urinal. This weekend I ripped her carpet up and have replaced it with cushion floor so it's easy to clean up. I just wish I understood what makes her do it. Unlike 'normal' children where it would be a bid for attention, this is almost a compulsion for her. I'm not sure if it's part of OCD, where she has to wee in her bedroom else she can't settle, or if she does it for the sensory input. I wish I knew. I wish I could get in her head and work out what goes off in that overworked, confused little brain of hers. Meltdowns are a part of every day life now. She has an obsession with the TV. She wants it on every minute of every day. Before I realised the obsession I showed her how to change the channel to one of the children's channels and she very quickly learnt all the numbers for all her favourite channels off by heart. Unfortunately, in her hurry, she doesn't always hit the buttons right meaning that a couple of times I had to wrest the remote off her and hurriedly change the channel from one of the adult channels that Sky sticks on. Fortunately there was never anything too bad on and I quickly worked out how to disable those channels so there's no chance of her doing it again! The Girl comes home from school, demanding the doofer (remote) and 'her TV' and there are major meltdowns if there is any reason why she can't watch TV. Heaven forbid I should want to watch something of mine! I can see us having battles over the next fortnight while Wimbledon's on! She squirrels the doofer away so no-one else can change the channel, having learnt that a 19 month old baby sister is very effective at finding the buttons and doing things to the TV. Unfortunately she has also realised that you can pause channels, so the TV gets paused if she needs the toilet, or for tea, and she's also discovered the +1 channels so sometimes we have to watch the same programme twice. And every so often, for some unexplained reason, she will watch a programme and then half way through rewind it back to the beginning and watch it again. I love my Sky+ but sometimes I wish I could disable it! Of course with the exposure to all this TV, my children are gradually developing American accents. According to the Boy we have garbage. And they play soccer. And jump rope. It's also affecting their aspirations. Most boys dream of becoming a footballer or engineer or a car mechanic or something really cool when they grow up. Who does Boy want to be when he grows up? Mr Bean. Poor kid. He doesn't stand a chance. It's heartbreaking though. I hate having the TV on all the time. I'm not a Jeremy Kyle mother! When the kids aren't around then the TV is off. I watch a bit in the evenings but I can't stand having it on all day. And if Girl didn't have her special needs then she wouldn't watch so much TV. But it's the one thing that calms her down and keeps her settled at home, and she has major meltdowns without it. Life isn't going to go her way all the time but I have to pick my battles and choose which ones are worth having meltdowns over, and for me, TV just isn't one of them. If you've had any experience with autism I would love to hear your thoughts and feedback because at the minute I feel like I'm wandering in the dark. Apparently there's some sports event going off in the summer in London. And I don't mean Wimbledon! 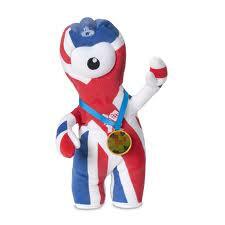 Anyway, for this sporting event someone came up with an interesting mascot called Wenlock. Who has one eye. I'm not sure if this is so that he can see the games better or what, but there you go. We were sent a singing, dancing Wenlock to review. When he arrived we were just on our way to the seaside but my postman was very relieved to have caught us on our way out the door as Wenlock had been singing to him all morning (which may explain why the batteries went flat rather quickly)! Wenlock is 35cm tall and stands firmly on his feet. He has poseable arms (which can be quite fun), and when you press a button on his toe the official mascot song plays and he dances to it. I thought he was hilarious as he has quite a bum wiggle! Which my son copied to a T! All the kids loved it, including Bug who keeps bringing him to me saying 'On, on!'. Boy, in particular, loves him, which pleasantly surprised me. Well here's a video of the kids playing with Wenlock. 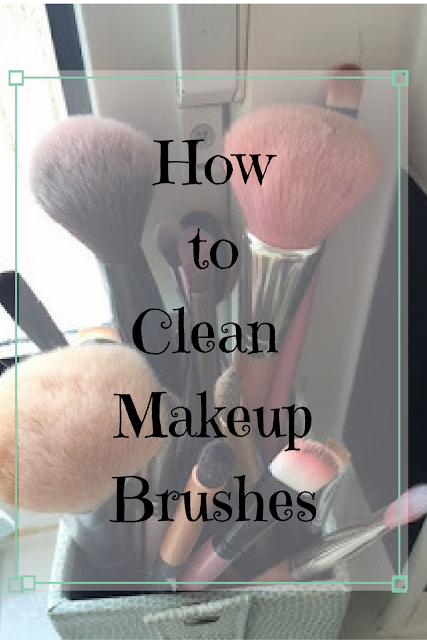 Please go easy on me, it's my first blogging video! We were sent Wenlock for the purposes of this review but no financial incentive was given. The opinions within this post are my own. I receive a fair few parcels so my son was delighted when a parcel arrived with something for him! We were sent 2 Bob the Builder Let's go to Work playsets, the Builder's Yard and the Suppliers Yard. 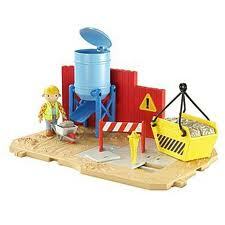 Both playsets are sturdy with lots of fun construction activities and one Bob the Builder character. 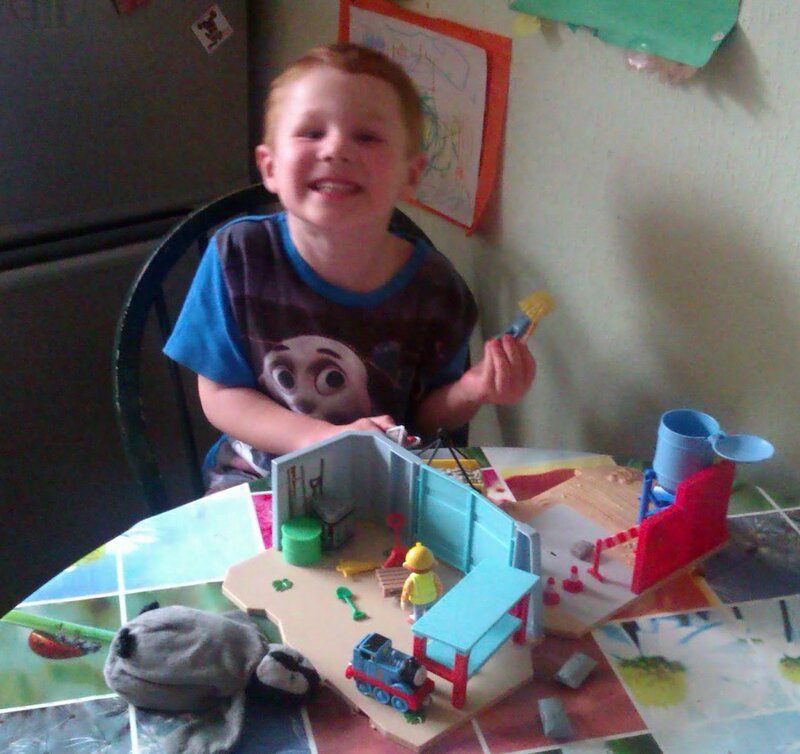 The Builder's Yard is great fun! It comes with Bob himself, a skip, a wheelbarrow, little pieces of 'concrete', a pneumatic drill and loads more accessories. There's a concrete chute where the lid lifts up and the child can drop the little pieces of 'concrete' (or anything else he can find!) down the chute and into the wheelbarrow. There are also tiles which lift up to reveal pipework underneath, and the pneumatic drill can be used as a lever to lift them up, which is a nice touch. The Suppliers Yard comes with Charlie, various building supplies, shelving and a little pallet lift. In fact there's so many accessories it's hard to know what to play with. Something I loved about these playsets is that although they can be played with perfectly well on their own, they can also be added to - you can buy track to connect the playsets up, and the skip and the pipes come with loops which you can use Lofty (if you have him) to lift them up. I shall definitely be buying some track and a Lofty as I think they will complete this set, although they are complete playsets on their own. 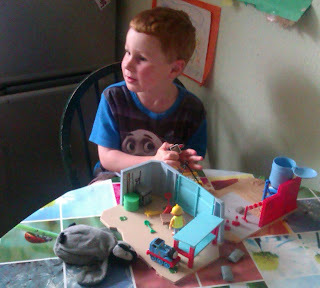 Boy was really happy with the playsets and keeps playing with them. The only slight problem I have with them is that there are loads of little bits which could easily get lost, and there's nowhere to store them, so I've had to supply him with a box to keep them in. Also, the accessories are very small so I've had to make sure to keep them out of the way of the Bug. At 18 months old pretty much everything goes in her mouth!! But other than that I think these playsets are great and would thoroughly recommend them. One Boy, very happy with his new toys! Thomas and the penguin aren't included in the playsets but appear wherever my children are! I didn't realise you could connect them up with tracks so just connected the 2 playsets together! I was sent the playsets for the purposes of this review but no financial incentive was given. The opinions within this post are my own.